Although many may not find the ghostly white skin beautiful these days especially with all the fake tanners available, I find pale skin to be very beautiful and pure and 32-year-old Guinevere van Seenus embodies that vision in an editorial entitled “Le Dame du Lac” or “The Dame of the Lake” for the 114th issue of Numéro for this June and July. Whimsically shot by photographer Jeff Burton by a dreamy lake, stylist Franck Benhamou dressed Guinevere in designs by the likes of Chanel, Versace, Herve Leger, Lanvin, Prada, Dolce & Gabbana, and John Galliano. Jacket, RM by ROLAND MOURET. Dress, BURBERRY. Skirt, Alexander McQueen. Left – Dress, VIKTOR & ROLF. Top, CHRISTOPHER KANE. Leggings, MISSONI. Shoes, Alexander McQueen. Right – Jacket, Alexander McQueen. Swimsuit, EMILLIO PUCCI. Tights, JONATHAN ASHTON. 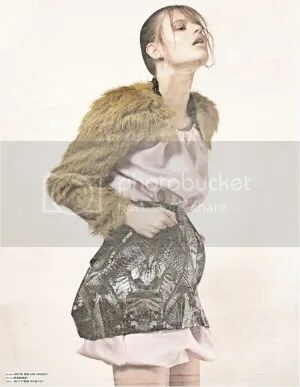 In many gorgeous pieces by the legendary designer Alexander McQueen, Bara is featured in an editorial entitled “Imbue” for the Ones2Watch shot by photographer Amarpaul Kalirai. I really enjoy this neutral background because it really emphasizes all the pieces. 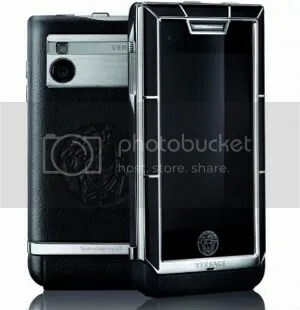 Versace and LG have teamed up to create the Versace Unique LG Mobile Phone for a new Haute Fashionable Technology. Starting at the high $6,000’s, the Versace Unique features a 5MP camera, Dolby Mobile surround sound, a sapphire crystal touch screen, which is the largest of its kind to ever be released, immune to scratches, and highly receptive, a handworked leather back featuring Versace‘s medusa logo, and either 18k yellow gold or 316L stainless steel on the front. As always, pretty in pink editorials always catch my eye especially when 20-year-old Estonian model Karmen Pedaru graces the cover of the June 2010 issue of Numéro Tokyo shot by photographer David Vasiljevic.